The graphite space can be tough for investors to navigate. Getting a grasp on it involves knowing a little about the different types of graphite. Graphite has a layered, planar structure with carbon atoms arranged in a honeycomb lattice. It’s because of this unique structure that graphite has such a stellar combination of properties; for example, it’s flexible, highly refractory, chemically inert and has high thermal and electrical conductivity. Those characteristics allow graphite to be used in a variety of places, including brake linings, foundry operations, lubricants, refractory applications and steelmaking. However, not all graphite is suitable for all applications. Indeed, there are three main types of graphite, and in many cases specific applications require one type in particular. Here’s a brief look at those three types of graphite and how they’re used in the world today. Flake graphite occurs as isolated, flat, plate-like particles with either hexagonal or angular edges. It is found in metamorphic rocks — such as limestone, gneiss and schist — and is distributed uniformly throughout the body of the ore or in concentrated, lens-shaped pockets. Today, flake graphite is one of most desireable types of graphite, largely due to its applications in the auto industry. 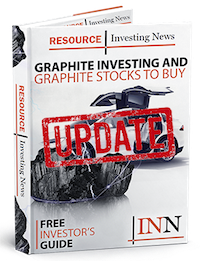 It’s the type of graphite required for the anodes of the lithium-ion batteries used in electric vehicles, and as production of these vehicles grows — spurred on by companies like Tesla (NASDAQ:TSLA) — flake graphite demand is seen increasing. Flake graphite comes in four basic sizes: jumbo, large, medium and fine. And while it can be tough to understand how they differ and how each size relates to purity, it’s important for graphite-focused investors to get a handle on those topics. In terms of how purity fits into the mix, Riddle said that in general, “the higher the purity of the graphite concentrate, the higher the average realistic FOB mine selling price tends to be.” Essentially, a purer product will likely require less processing, and thus will cost the producer less money to make. Overall, then, it would appear that large-flake, high-purity graphite is the most desirable product for a company to have. However, Andrew Miller of Benchmark Mineral Intelligence has explained that the equation is not always that simple. “Quite often because of the niche requirements of each industry … they have very specific criteria. For some industries purity is more important, and for other industries flake size is more important,” he told INN. As mentioned, flake graphite is a key component of the lithium-ion batteries used in electric vehicles. However, it’s important for investors to remember that flake graphite has applications beyond lithium-ion batteries. For instance, fuel cells use even more graphite than lithium-ion batteries, and some expect them to replace combustion engines as a more efficient means of converting fuel to energy. Fuel cells are also making their way into the personal electronics sector and even into the utilities sector, where they can be used to provide emergency power to hospitals or turn methane gas into electricity at wastewater plants. Flake graphite is also an essential part of vanadium-redox battery technology, with nearly 300 tonnes of flake graphite required per 1,000 megawatts of storage. The unique properties of vanadium and graphite combined allow for the long-term storage of excess energy. Pebble-bed nuclear reactors, which use uranium embedded in fist-sized graphite balls, are another example of how important graphite is becoming to the energy sector. Just one 100-GW pebble-bed nuclear reactor requires 300 tonnes of graphite to start initial production, followed by an additional 60 to 100 tonnes per year for continual operation. Amorphous graphite is found as extremely small, crystal-like particles in beds of mesomorphic rocks like coal, slate and shale, and its carbon content depends on that of its parent material. When found in coal, it is the result of the thermal metamorphism of coal and is referred to as meta-anthracite. However, unlike coal, amorphous graphite is not used as fuel as it is difficult to ignite. According to Riddle, amorphous graphite that is marketable today typically ranges in purity from 70 to 90 percent. “You can’t afford to upgrade it if you are to be cost effective,” he said. While amorphous graphite is one of the less popular types of graphite, it has its uses as well. Amorphous graphite is used in the refractories industry to manufacture crucibles, ladles, molds, nozzles and troughs that can withstand very high temperatures, particularly the casting of steel. Indeed, the electrodes used in many electrical metallurgical furnaces, including the electric arc furnaces used in steel processing, are manufactured from this type of graphite. Furthermore, in the production of steel itself, graphite is used as a carbon raiser to strengthen steel. It’s also used in blast furnace linings for the production of iron because of its high thermal conductivity. Aside from the refractories industry, amorphous graphite is also used in brake linings, gaskets and clutch materials. Additionally, amorphous graphite is used in foundry facing mold wash, where it helps ease the separation of casted objects from molds. Finally, low-quality amorphous graphite, mostly from China, is used to make pencil lead. Vein graphite, also referred to as lump graphite, is believed to have hydrothermal origins and occurs in fissures or fractures, appearing as massive platy intergrowths of fibrous or needle-like crystalline aggregates. Vein graphite is believed to originate from crude oil deposits that through time, temperature and pressure were converted to graphite. Riddle said that the veins “are extremely small and range between 5 and 10 centimeters wide,” and generally have a purity level of 70 to 99+. Graphite in this form is found all over the world, but is only currently mined in Sri Lanka. Of the types of graphite it is considered the rarest. Vein graphite is used in advanced, thermal and high-friction applications such as car brakes and clutches. It can also be used in much the same way as flake graphite as its shows great performance in applications that require high thermal and electrical conductivity. This is an updated version of an article originally published by the Investing News Network in 2012.